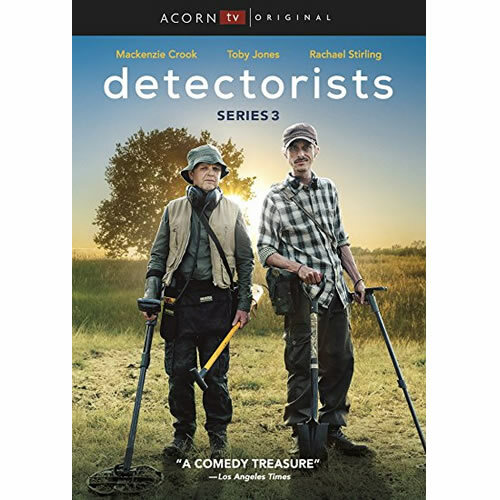 The BAFTA Award winner for best comedy returns with new misadventures for metal detecting hobbyists Andy (Mackenzie Crook, Pirates of the Caribbean) and Lance (Toby Jones, Witness for the Prosecution) as they search the Essex countryside for gold while dealing with their messy personal lives. To save up money for a place of their own, Andy and his wife, Becky (Rachael Stirling, The Bletchley Circle), have moved in with Becky’s formidable mother (Diana Rigg, Game of Thrones), and Andy’s new position as an archaeologist is not the dream job he thought it would be. Lance worries that having his daughter live with him is causing problems for his girlfriend. And to top it off, Andy and Lance may lose their favorite detecting field to the construction of a new solar farm. “Detectorists” is a sweet, gentle series. To those who have given low reviews because they are offended by the language, I can only say you must realize that this is a *British* series and this is a cultural difference. The “F-bomb” as it is styled, is normal descriptive language there. I suspect that they would be more offended by “bloody” which to us, as Americans is about on a par with “dang”. Give it a chance. Think about it a bit. After seeing Mackenzie Crook in Game of Thrones I wanted to see him in something else and settled on this show. It’s not really the kind of show that makes you laugh but it grows on you so much that you can’t wait to see the next episode. The characters are like real life people instead of the usual sitcom characters who go for a laugh every 15 seconds. What is impressive is that Crook wrote and directed every episode himself as well as play the main character. The best British comedy series I’ve seen in years and I’ve seen a lot of them.